Rated as one of the top three Neil Diamond tribute acts in the UK, Ian's likeness is uncanny ! 'Cherry Cherry', 'Beautiful Noise',"Play Me' and 'Sweet Caroline'. He wears the costume and look from the 'Jazz Singer' which was Neil Diamond at his peak. The audience are totally captivated and involved in the performance, as the tempo goes up and down and the mood changes from romantic ballads to storming classics like 'I'm A Believer' and "Cracklin' Rosie ". Ian's magnificent voice re-creates the emotion, excitement, passion and "spiritual" feel of Diamond's songs. Ian's Neil Diamond tribute show take's the audience there, involves them, hands-clapping, and he doesn't let go until a fantastic heart-thumping, foot stomping, roof-raising finale! A Dynamic Performance by .......... "THE VOICE"
Ian has a magnificent and powerful voice that is truly a match for popular music's major singing stars. Many artistes can sound like a particular star but few are great singers. Ian is a great singer. 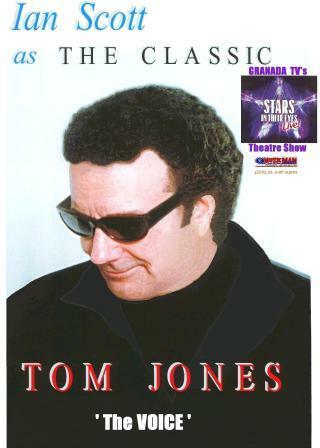 Tom Jones deserves nothing less from a Tom Jones tribute act. After 4 years as a cabaret artiste where he earned the title of "THE VOICE" - he was spotted by an agent while supporting one of the top ABBA tribute acts. He has never looked back since. and even involving some of them on "What's New Pussycat?" They love it!